(by Scott Johnson, PowerLineBlog) — February 22 is the anniversary of the birth of George Washington. Of all the great men of the revolutionary era to whom we owe our freedom, Washington’s greatness was the rarest and the most needed. [So many years later] it is also the hardest to comprehend. Take, for example, Washington’s contribution to the Constitutional Convention of 1787. Washington’s mere presence lent the undertaking and its handiwork the legitimacy that resulted in success. The convention’s first order of business was the election of a presiding officer. Washington was the delegates’ unanimous choice. The esteem in which he was held by his fellow citizens was similarly crucial to the implementation of the Constitution during his presidency. 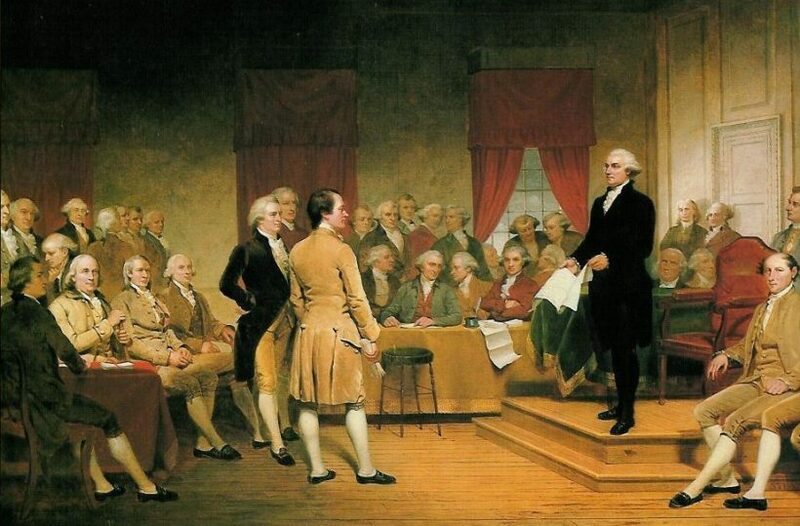 In 1790 Rhode Island became the thirteenth state to ratify the Constitution. To mark the occasion, President Washington made a ceremonial visit to Newport when Congress recessed in August. Newport welcomed Washington with open arms. In Newport on August 18, according to James Thomas Flexner, Washington “completely fatigued the company” by briskly walking…from nine in the morning until one in the afternoon. In anticipation of Washington’s visit to Newport, the members of America’s oldest Jewish congregation prepared a letter welcoming Washington for presentation to him at a public event on the morning of August 18. The letter was authorized by the congregation’s board and signed by its president, Moses Seixas. It is Washington’s magnificent letter responding to Seixas that is known as a testament to religious freedom and that has become famous as one of the classic statements of religious toleration in America. With pleasure we reflect on those days — those days of difficulty, and danger, when the God of Israel, who delivered David from the peril of the sword, — shielded Your head in the day of battle: and we rejoice to think, that the same Spirit, who rested in the Bosom of the greatly beloved Daniel enabling him to preside over the Provinces of the Babylonish Empire, rests and ever will rest, upon you, enabling you to discharge the arduous duties of Chief Magistrate in these States. This so ample and extensive Federal Union whose basis is Philanthropy, Mutual confidence and Public Virtue, we cannot but acknowledge to be the work of the Great God, who ruleth in the Armies of Heaven, and among the Inhabitants of the Earth, doing whatever seemeth him good. For all these Blessings of civil and religious liberty which we enjoy under an equal benign administration, we desire to send up our thanks to the Ancient of Days, the great preserver of Men beseeching him, that the Angel who conducted our forefathers through the wilderness into the promised Land, may graciously conduct you through all the difficulties and dangers of this mortal life: And, when, like Joshua full of days and full of honour, you are gathered to your Fathers, may you be admitted into the Heavenly Paradise to partake of the water of life, and the tree of immortality. Today, as we contend with the contemporary equivalent of “the Babylonish empire,” let us send up our thanks to the Ancient of Days for this indispensable man. Published September 22, 2010 at PowerLineBlog .com. (First posted February 2006.) Reprinted here February 11, 2016 for educational purposes only. 2. The purpose of an editorial is to explain, persuade, warn, criticize, entertain, praise, exhort or answer. What do you think is the purpose of this editoral? Explain your answer. 3. Tone is the attitude a writer takes towards his subject: the tone can be serious, humorous, sarcastic, ironic, inspiring, solemn, objective, cynical, optimistic, encouraging, critical, enthusiastic… Which word do you think best describes the tone of Mr. Johnson’s commentary? Explain your answer.